PLUS – Product Lifecycle Usage System - is a Software Asset Management system that keeps track of procured software and its compliance with the terms and conditions of licensing, throughout its lifecycle. PLUS is offered on a hosted SAS application model to manage all your software assets. It can handle complex and varied licensing policies from different software vendors. By keeping track of the usage of the software, it helps you to be compliant with the terms and conditions of usage of the software. Perform what-if scenarios to ensure that your licensing terms are optimal. Spend money for software that you actually use and not on shelf-ware. Getting a better, centralized view of spend with each vendor will help you negotiate more favorable terms with the vendor for future purchases. Plus comes pre-configured with major software vendors and popular software and can quickly be configured to handle software from other vendors too. PLUS has been designed to ensure that your security policies can stay intact and uses XML data interchange standards. You can get started using PLUS very quickly. Import existing products, vendors and licensing policies using the open interface. 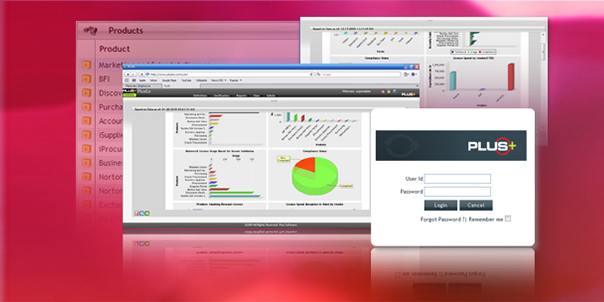 Various graphs and reports can be configured to your specific needs. Use the drill down features to get more information from graphs and charts. To create management reports; graphs and charts can be exported with the click of a button to various desktop applications like Word, Excel and Adobe PDF. PLUS helps you to better manage and track your software assets and usage. With its flexible structure, it can help automate the tracking of complianceof software with licensing terms; however complex the licensing terms may be. PLUS provides you with a variety of graphs and reports that can help you make better informed decisions. Copyright © 2013 Stridus, Inc. All rights reserved.